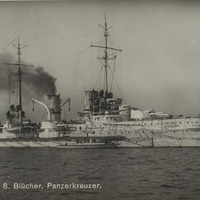 This postcard features a black and white photograph of the German armored cruiser Blucher, Known for being sunk at the Battle of Dogger Bank by the British during World War 1. 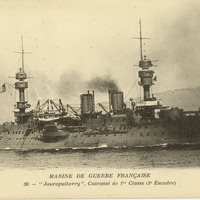 This postcard features a black and white photograph S.M.S. 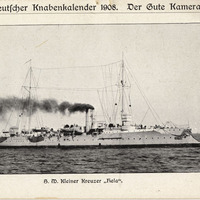 Hela, a late 19th century German light cruiser. 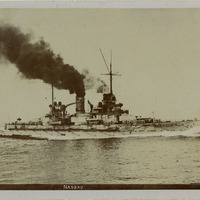 This postcard features a black and white photograph of the first German dreadnought-type battleship the SMS Nassau. 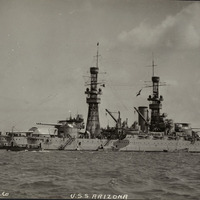 This postcard features the battleship USS Arizona at sea prior to its sinking at Pearl Harbor in 1941. 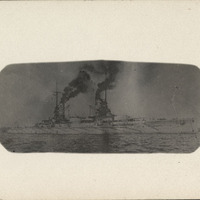 The image is a 3.5 "x 5.5" black and white photograph. 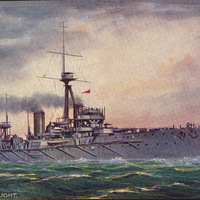 This postcard features an oil painting of the revolutionary HMS Dreadought at sea. The image is a 3.5" x 5.5" color painting. 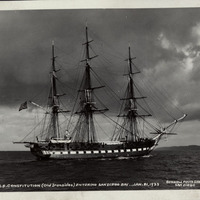 This postcard features the sailing ship USS Constitution at sea. The image is a 4" x 5" black and white photograph. 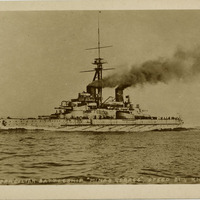 This postcard features the Imperial German battleship Kaiser at sea. The 1.5" x 3.5" black and white photo sits centered on a 3.5" x 5.5" postcad. 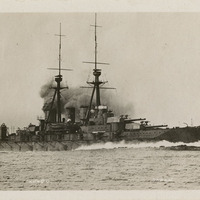 This postcad features a black and white photograph of the German pre-dreadnought Worth, a novel ship for having 6 main guns instead of the usual 4. 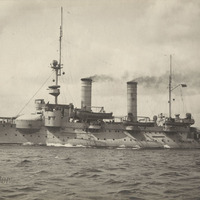 This postcard features a black and white photograph of the German coast-defense ship Siegfried, a forerunner of the battleships of the High Seas Fleet. 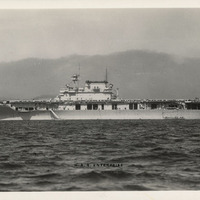 This postcard features a black and white pre- World War 2 photograph of the USS Enterprise, which would go on to become the most decorated ship in the United States Navy. 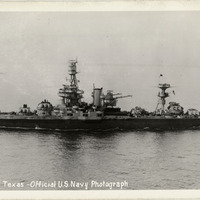 This postcard features a black and white photograph of the USS Texas at sea, currently a museum ship and the only surviving example of a dreadnought-type battleship. 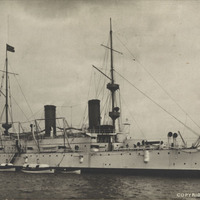 This postcard features a black and white photograph of the USS Olympia, a protected cruiser of the US Navy currently preserved and notable for its role as the flagship during the Spanish-American War. 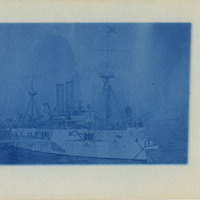 This postcard features a cyanotype photograph of the USS Maine, famous for being sunk to start hostilities of the Spanish American War. 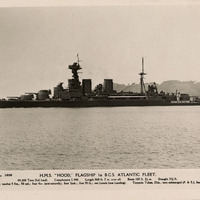 This postcard features a black and white photograph of the HMS Hood, the ultimate evolution of the battlecruiser concept designed at the end of World War 1- famous for beying destroyed by the Bismarck in World War 2. 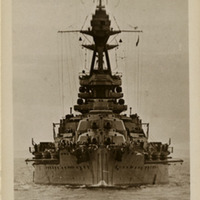 This postcard features a black and white photograph of the HMS Warspite, a Queen Elizabeth Class battleship that participated in Jutland and saw extensive combat in the Second World War. 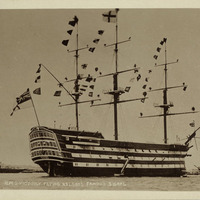 This postcard features a black and white photograph of the HMS Victory which was Nelson's flagship at the Battle of Trafalgar and is still in commission currently. 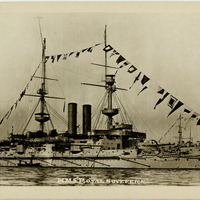 This postcard features a black and white picture of the HMS Royal Sovereign, which was a transitional ship merging the gap between ironclads and pre-dreadnought battleships. 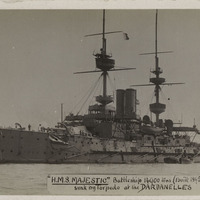 This postcard features a black and white photograph of the HMS Majestic; influential in being the first ship to standardize on the pre-dreadnought battleship layout. 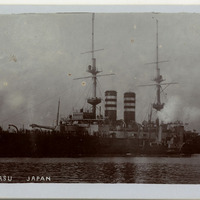 This postcard features a black and white photograph of the Japanese pre-dreadnought Mikasa, famous for being the flagship at the Battle of Tsushima and is a museum ship today. 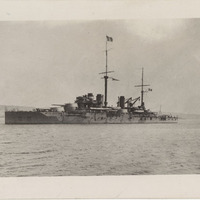 This postcard features a black and white photograh of the Japanese battlecruiser Kongo at sea. Designed after the British Lion class, it was later sunk durign World War 2. 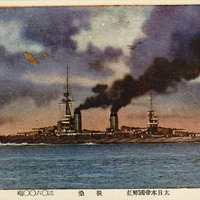 This postcard features a color oil-painting of the Japanese battleship Fuso at sea. A powerful Japanese ship; it carried 12x14" guns. 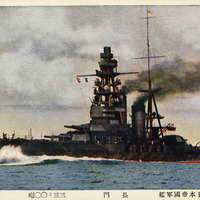 This postcard features a color oil-painting of the Japanese battleship Nagato at sea. It carried 8x16" guns and is notable for being sunk by the United States in the Bikini Atoll atomic bomb tests after World War 2. 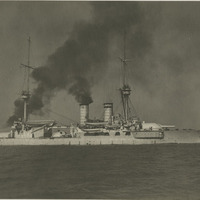 This postcard features a black and white photograph of the Brazilian battleship Minas Geraes. Built by the British, this ship sparked the South American naval arms race. 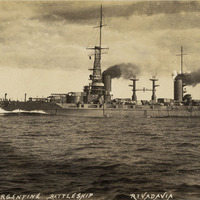 This postcard features a black and white photograph of the Argentine battleship Rivadavia. Built by the United States for Argentina to counter the Brazilian battleships. 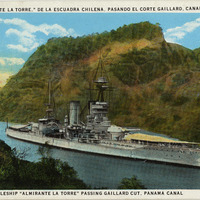 This postcard features a color oil-painting of the Chilean battleship Almirante La Torre passing throught the Panama Canal. Built by the British for the Chilean Navy. 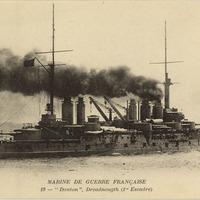 This postcard features a black and white photograph of a static model of the French ironclad Gloire. This ship is notable for being the first ocean-going ironclad ever built. 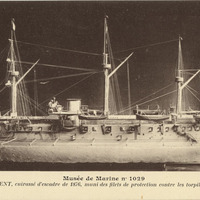 This postcard features a black and white photograph of a static model of the French ironclad Trident. 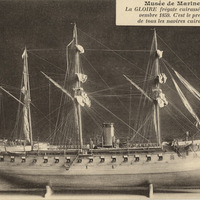 Constructed in the 1870's, it was a notable improvement over the Gloire and showcases the rapid development in ship design.